Joe Sabourin, the front man, guitarist and singer-songwriter of the eclectic folk-rock band My Mother's Moustache, is a recent Burlington transplant. The former Bostonian moved to Vermont in 2016 and quickly insinuated himself into a few local projects. He's a new addition to the Celtic punk band the CopOuts and plays alongside Sarah Griffin in her ska and Latin-tinged band, Skeleton Dancer. Sabourin seems to be quite the musical chameleon. That's true of MMM's music, as well. The band's new EP, Down From the Door, may not be the best indicator of what to expect from a live performance. The malleable tunes are vessels for the players who bring them to life and will sound different based on who's available to join Sabourin on a given night. Old-world folk, rootsy rock and Appalachian charm drive the new collection. With mandolinist Colin Rugg, drummer Nick Matthews and multi-instrumentalist Annie Dreher — the last of whom handles keys, saxophone, bass and backup vocals — the bandleader presents a palatable assemblage of lyrical and instrumental tracks. His vocal intonations are reminiscent of the Decemberists' Colin Meloy, and MMM's music does share some of the same DNA as the Portland, Ore., indie-folk superstars. Fortunately, Sabourin's writing is far less precious and pretentious, swapping honesty and earnestness for Meloy's literary pomp. "Amaryllis" is an acoustic reimagining of "Eyes of the Amaryllis" from MMM's heavier, electric-guitar-driven previous effort, Stories We Tell: The Studio B Sessions. The original's descending, overdriven riffs are transformed into spindly, delicately plucked ones. The revision is more Dave Matthews Band folk-rock than Stone Temple Pilots alt-rock. A saucy minor-key, subdued saxophone and wispy background unite on the opening cut, "Ghosts." A winking, street-theater sensibility reinforces the overall ambiguity of Sabourin's musical affinities. Is he wearing a costume on this album? He may as well be strutting across a makeshift proscenium as he sings, "Because every day we see these things / That we can't explain." Guitar and mandolin strike out on separate paths on the title track, both melodically and in terms of production. (The instruments are panned left and right, respectively.) Recalling sea shanty vibes, the track billows and breathes in three-quarter time. As the singer remembers a forgotten friendship, the mandolin percolates over swells of vocal harmonies. "Come On Up to the House" is a jangly number that begs listeners to sing along with its simply structured verse and chorus. The entire group chimes in as the stringed instruments drop out, leaving only vocals and tambourine to drive its inviting offer home. Down From the Door is a warm addition to Vermont's ever-expanding folk canon. However, knowing Sabourin's tendency to change things up, the next MMM album could sound completely different. 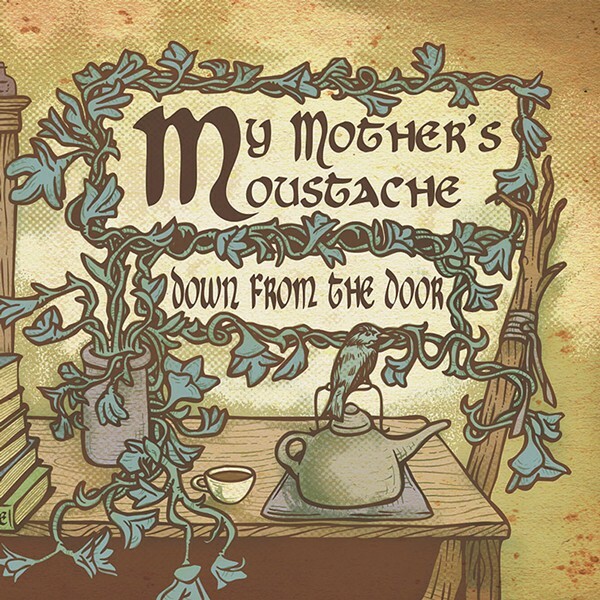 Down From the Door is available at mymothersmoustache.bandcamp.com. The band celebrates its album release on Thursday, November 9, at Nectar's in Burlington.